MOSCOW, March 26. /TASS/. Chain stores offering paper bags instead of plastic ones to consumers should be supported, Russia’s Special Presidential Representative for Nature Protection, Ecology and Transport Sergei Ivanov said on Monday. "I already said that chain stores should be stimulated to offer paper bags instead of plastic ones, or consumers should at least have some choice that they don’t have now," Ivanov said at a round-table discussion in the State Duma devoted to food security. He added that now consumers get plastic bags without bearing any responsibility for their utilization. 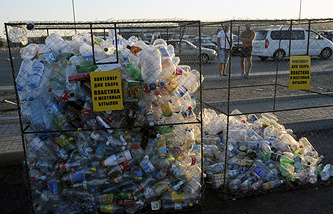 Ivanov reiterated that plastic bags are taken to landfills where they take centuries to decompose. "This problem should be addressed by imposing a utilization fee and constantly increasing it, as well as by developing new packaging technologies and the usage of special paper," Ivanov said.